Ottawa Mommy Club Readers, one area of the beauty world that usually does not attract a lot of my attention are my nails. I have horrible nails. I tend to keep my nails low because they always chip and break. I never get manicures because, well, this procedure would get ruined a few hours later because I am always using my hands and, playing with my kids ends up with wither me washing my hands often or the polish chipping.I usually keep them like this because I just do not have the time to maintain my nails and to have fun with them. I love admiring perfectly polished nails, but I could never have them for myself for long periods of time. When I was offered the chance to review Kiss Nails, I jumped at the chance to try and pamper a part of my body that has been sorely neglected for a long time. Kiss Nails is the largest manufacturer and distributor of professional quality nail products in the world. Kiss was the first company to provide quality, professional nail care straight to the consumer that is easy-to-use to achieve salon results in the comfort of their own homes in a complete kit. Kiss has expanded its beauty line to include nail care, nail jewelry, nail art and manicure and pedicure tools. Kiss nails also promise to be more flexible and waterproof, so the product go onto nails easier and will stay on nails for a week. Since my younger daughter was eyeing the Kiss impress Press-On Manicure Kit in Symphony because a) she LOVES pink; and b) she LOVES sparkles, I decided to try this all-in-one kit first. Being all but a rookie where my nails are concerned, I thought there was going to be more involved with applying these nails, but they were really easy to follow, and I applied the nails in no time. I really liked wearing these nails! They went on easily, and they stayed on really well until I was ready to remove them. They did not budge once or chip. For these nails, removal was a breeze as well! All I had to do was to peel the nail away from the sides and they came off. I also tried these all-in-one kits in the Bells & Whistles and Harlem Shakes. 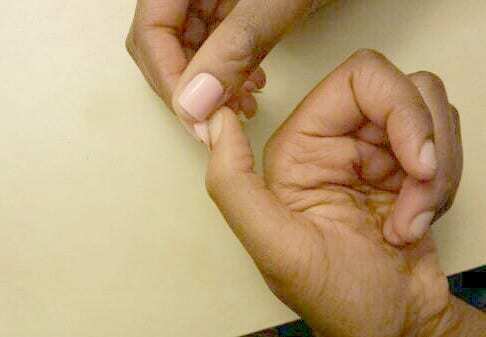 I then had to use soap to remove any left-over glue on my nails. I also had fun using the Kiss Salon Secrets Nail Art Pro Tool Kit and the Salon Secrets Rococo Veil Kit with the Kiss impress Press-On Manicure Kits to further jazz up my nails. I added sparkles to accent one of my nails found in the Salon Secrets Nail Art Pro Tool Kit with the , and I added a fleur-de-lis to my thumb following the instructions in the Salon Secrets Rococo Veil kit with the Kiss imPRESS Press-On Manicure Kit in Harlem Shakes. It only took minute to apply these extra touches to add more flair to my nails. I only had two issues with the impress Press-On kits. The first one was avoiding water or fussing with the nails. Being a mom of two toddlers makes it really hard to avoid water for an hour or to not fuss with the nails. The other issue was that the nails made for the thumbs were too short for my thumb nails. 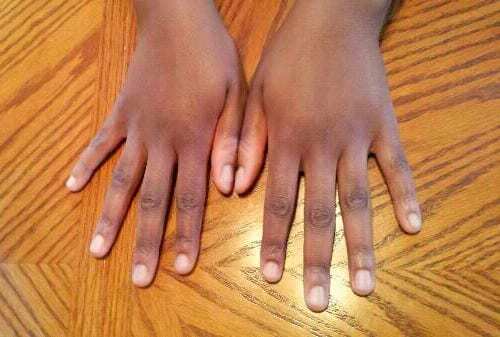 This may due to the fact that my fingers are longer than what is deemed to be average. Even after cutting my thumb nails down as far as they can be cut and applying the nails, you could still see my nail peeking out from underneath the product. 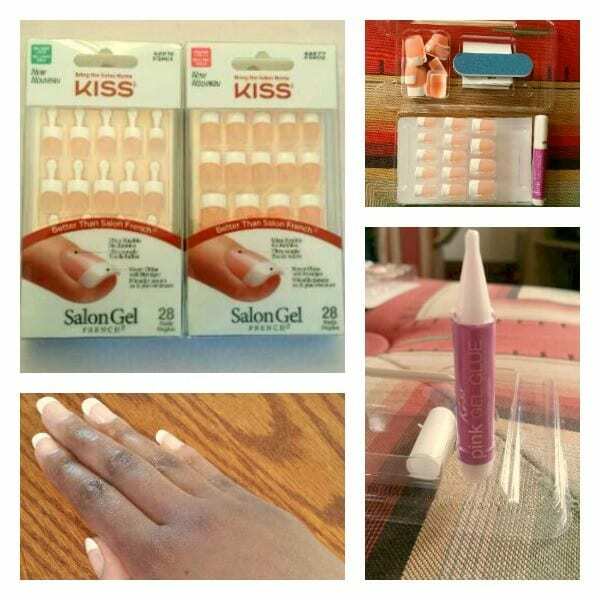 Now I was ready to move onto a more classic look by trying the Kiss Salon Gel French Nail Kit in Medium Length. I did not try this series in the Real Short because, as I encountered with impress Press-On Kits, my thumb nails were too long. Again, the instructions were really simple to follow, and I had this product on my nails quickly. 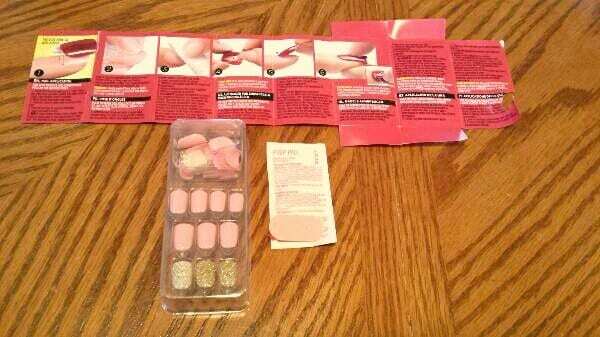 The pink gel that is included in this kit set really fast, and I was able to pick things up and even type easily. Removal of this product took a bit longer because the glue I used for these nails was a liquid one and was applied to both the product and my nails before application. I had to soak my nails in acetone based polish remover until the product was soft and could come off. Once this happened, the nails came off easily. Overall, I really enjoyed using the products Kiss sent me to review. These products were simple and easy to apply to my nails, they did not chip or crack when they did hit against objects or while typing on my keyboard or come off when added to water. They were also easy to remove, the variety of colours in the imPRESS Press-On Manicure Kits were all fun and great for different occasions, and adding more personal touches to your nails was fun to do as well! I would recommend products from Kiss whether you are a novice nail art artist or if you have been dressing up your nails for years. I will definitely be using this product again and again to pamper my nails. If you would like more information about Kiss, you can visit their website. You can also connect with Kiss on their Facebook, Twitter and YouTube pages! Disclaimer: I received products from Kiss in order to write this review. The opinions expressed are my own. The ARV of this giveaway prize package is $65! This giveaway is open to Canadian residents and ends at May 25th, 2015 11:59 EDT on May 4, 2015. The create a nail art kit by little diva would be a hit here! i would love to try the French manicure kit – always looks so nice and clean on other people – would really like to have nice nails! 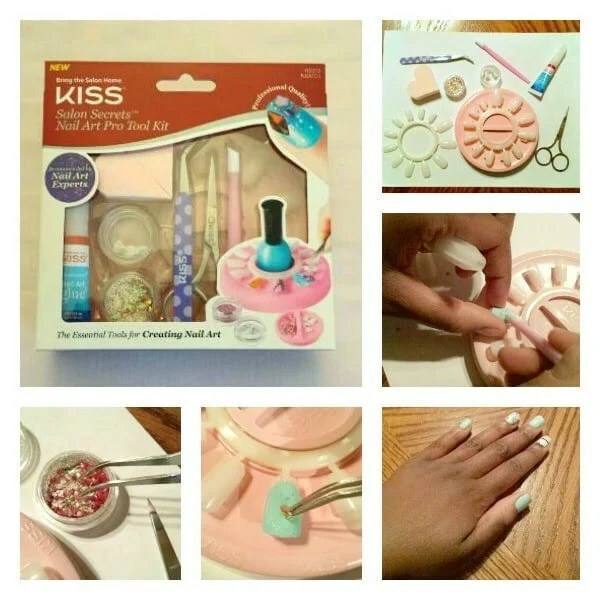 The Salon Secrets™ Nail Art Starter Kit by KISS looks fun! I would so love to try them all. My favorite is the French manicure. Who doesn’t like a nice manicure. My gfavorite Nail Kiss product is the Gel Fantasy Nails by Kiss – Charmed Life. the lightening speed looks good! My favourite is the Salon Secrets Nail Art Starter Kit by KISS. My Fave kiss products are the everlasting nails, they look great on, and last for at least 5-7 days. The Nail Dress Mix it Up by KISS is something I’d use. I really like the GALAXY EFFECTS KIT BY KISS. I like the ever lasting french tip collection. I like the Nail Art Variety Pack. I like Gel Candy Sticker Nails by LITTLE DIVA – Crystal Persuasion. The Nail Art Variety Pack would be fun to try out. I like the Everlasting French Collection….simple and classy. My favourite one to try, would have to be Kiss Nail Dress, in any colour! Kiss Salon Secrets Nail Art Pro Tool Kit looks nice! Love to try it! I really like the Nail Art Variety Pack by KISS. I love the imPRESS manicure short collection — easy to apply and the short length I enjoy. My favorite is the French manicure,but seriously I love them all! I like press on manicures… the one that caught my eye while browsing was the imPRESS Glitter, manicure short in “bright as a feather”. Thank You! Since I am a traditional kinda gal – my favourite would be the French manicure – but they are all really cool, and fabulous for someone like me with crappy nails that just break and split constantly. There is one on my computer. Maybe refresh your screen? I like the Short Manicure Bright as a Feather,Thanks for the chance!